With more than 400 erupting volcanoes, Jupiter's closest moon is the most geologically active body in our solar system. 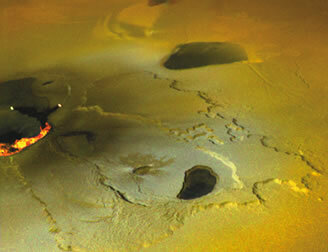 Despite all the hot lava, however, Io is deathly cold — not a site you would want to visit on your summer vacation. 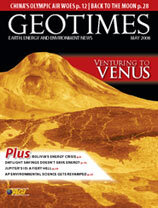 Scientists suspect that Earth and Venus formed from the same parent material 4.5 billion years ago. They know that the two planets are similar in size, makeup and distance from the sun. But what they don’t know is why Earth developed into a planet able to support life while Venus degenerated into a scorching wasteland. New missions should help scientists get to the bottom of this mystery. When we last set foot on the moon in 1972, no one imagined it would be more than three decades before we would return. Plans to return humans to the moon are under way — but will the moon be a stepping stone to Mars or a destination all its own? When the College Board asked earth and environmental scientists to help rewrite its Advanced Placement Environmental Sciences curriculum, some geoscientists saw it as an opportunity to uplift geology's profile among students. Wasting energy by saving time? Do you think we should focus on sending people into space? Do you know where your food comes from or how much carbon dioxide was produced from getting it to you? Tracking "food miles" has become the latest trend, but not everyone agrees the term is useful. NASA recently released the latest in a series of highly visual space books that are geared toward all students — those who can see and those who cannot. Braille and written text accompany textured images that students can both see and feel. Late last year, the Environmental Protection Agency denied a request by California to adopt its own emissions standards for new automobiles. California appealed, and now the battle is back in court. Soaring energy prices and record-breaking profits have emboldened some countries to “reconsider” their relationships with foreign oil companies operating within their borders. It’s a short-term perspective. After several decades of a love affair with beautiful, large, gas-guzzling cars, it’s time to end the affair and get on board the efficiency wagon. Most of Venus’ surface is low volcanic plains with the occasional rise of a volcano or mountain. Image is courtesy of NASA/JPL.